Our range of CNC machines are specially designed and manufactured as per detailed industrial requirements. Engineered with perfection, these CNC machines are used for turning, milling, drilling, tapping, boring & many other jobs. 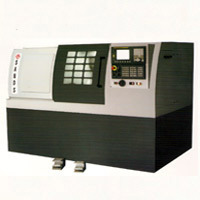 These CNC machines are offered in various combinations, which aids in extensive production of materials at a low cost. The components of the CNC machines is manufactured from purest variety raw material like rolled ferrous and non ferrous steel, forgings or castings, mild steel, stainless steel, alloy steel, brass and aluminum. Effectively operating, the CNC lathe machines are fabricated with innovative designs & modern technological procedures. The raw material used in manufacturing CNC lathe machine is of purest & concrete variety, which further assures the durability of the CNC lathe machine. With an extensive working life, the CNC lathe machines meet all the spheres of the commercial as well as technical viabilities.